The lives of upstairs guest and downstairs servants at a party in 1932 in a country house in England as they investigate a murder involving one of them. Roger Ebert: It has been said that the most enjoyable lifestyle in history was British country house life in the years between the wars. That is true for some of the people upstairs in this movie, less true of most of those downstairs. Altman observes exceptions: Some of the aristocrats, like Lady Constance, are threatened with financial ruin, and others, like Novello, have to sing for their supper; while below stairs, a man like Jennings is obviously supremely happy to head the staff of a great house. And as Mrs. Wilson the housekeeper says of herself,"I am the perfect servant. I have no life." 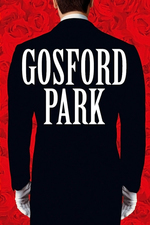 NY Times: When it comes to portraying the upper class, ''Gosford Park'' succeeds in having its cake and eating it too. While demolishing the ''Upstairs Downstairs'' myth of kindness toward those of lower station, it allows these jaded, chilly malcontents to retain a patina of supercilious glamour. Rolling Stone: Don't bother with those who fault Altman for co-opting the class issues raised in Jean Renoir's 1939 classic The Rules of the Game and filtering them through his allegedly misanthropic eye. Not so. Be it McCabe and Mrs. Miller or Short Cuts, Altman invariably stands with the foolish mortals who inhabit his films, not in godly judgment of them. A line from Renoir's film — "Everyone has his reasons" — sums up Altman's work. No misanthrope directed the lovely scene in which the servants, standing outside the drawing room, crane to hear snatches of the tune Novello sings to the distracted guests. Gosford Park abounds in scenes to savor. It's a feast, and one of Altman's best. After suffering through five anachronistic seasons of Downton Abbey, I refuse to believe that Julian Fellowes was entirely responsible for this script. I wonder if Altman had a lot of input, because this film has much more bite to it. I see something new each time I watch it. It's nearly perfectly cast. The only two off performances for me were Stephen Fry's detective and Ryan Phillippe's servant/actor/barely-tolerated guest. All I remember is that I loved it! I saw Fry's character as a callback to the country detective/Grand House Murder Mystery thing. Jarring perhaps in the context of the brilliance of everyone else, but I think Altman was trying to reference a bunch of tropes and kinda had to include something Agatha Christie-esque. And while I think that as an actor, Ryan Phillippe is best watched on mute, his casting was just as good as the others: a fish totally out of water, totally out of his depth. And and this movie is the best thing Altman's ever done. Everything is just pitch perfect, so almost too-on-the-nose that it straddles the razor thin line between absolutely right, and satire. This totally sounds like my kind of movie and I'm not sure how I've never heard of it. Watching now! The only two off performances for me were Stephen Fry's detective and Ryan Phillippe's servant/actor/barely-tolerated guest. Casting Ryan Phillippe was completely *brilliant*. It's identical to casting Tom Cruise in EYES WIDE SHUT: someone out of his depth, knows he's out of his depth, and betrays that emotion to the camera to great success. Great film all around, and I agree that I'll take this two hours over the endless insufferable British Simpsons that is "Downton Abbey". Everything is just pitch perfect, so almost too-on-the-nose that it straddles the razor thin line between absolutely right, and satire. Yeah, in terms of Steven Fry's character, he felt like a bit of a lampshade for this. Kind of like saying "Yes, we know you're taking this seriously, because we're good filmmakers, but just letting you know we're having a bit of fun here." I started watching Downton on the strength of this movie. Loved it to bits. I love this movie so, so much. It's everything wrapped in one: a murder mystery, a window into another time and culture, a feast for the eyes (those bias-cut evening dresses! ), tragedy, a comedy, a romance, both hopeful and sad. I don't normally care to see movies more than once, but this one is one you almost have to watch more than once because there's too much in it to take in in just one viewing. Not the least of its pleasures was Jeremy Northram's musical performances. I am listening to "The Land of Might-Have Beens" as I write this. This movie is beloved to me because it contains to the most understated but bone-deep-cutting burn by Maggie Smith as the Countess of Trentham. I can't find a convenient video, but that scene is the reason one of my friends and I use a dismissive 'Difficult colour, green' as shorthand for 'YOUR EXISTENCE IS LOATHSOME AND IS AS SCUM BENEATH MY BOOTS' when talking to each other. That line and delivery in their proper context are the apex predator of worthlessness-inducing put-downs. Allegedly it's here, though the actual video isn't loading for me.